Sometimes a story should just start from the beginning. This is an excellent story, but it feels like a part two, which it basically admits to being, but we didn't get the first. So, as they fight for Emma's life there is no real feeling behind it because so far none of the characters has grown on me. Everyone tries to do Magical Girl better than the last person who did Magical Girl, and while this does it well, it is beginning to feel too much like a part two where I might have cared more about the characters if I had read the first part. The main story seems interesting, but there was too much minutia here, especially since I'm not being given much motivation to actually care about anyone. Honestly, I am in love with this series! I need more! I'm already so attached with these girls. Emma's my favorite but I'm biased when it comes to gemini association. But all three are my favorite also. Also, does this series have LGBT flavor to it? Because if yes, I AM SO HERE FOR THAT! Omg, I'm fangirling so hard right now it's embarrassing.And is this series going to have a graphic novel? Because I'm so down for buying every comic issue and graphic novel(s). Which I haven't done with any other series. 4/5Loved this issue, huge step up. Solidified my first ZS ship, and I peeped some Victorian looking ladies in one of the panels, possibly a hint towards the past guardian women in the girls families? It reminds me SO MUCH of Sailor Moon. I'm a pretty big fan of the art in these comics, as well. I'll finish the last 2 in the series tomorrow. This is definitely cute and fun, and a somewhat-lighthearted read. Ooh I liked this one way more than #1! Looking forward to the rest. This issue wasn't as good as the first. While it's a great twist to see the team who saved the world AFTER they've saved the world, the plot is relying on us being attached to the girls which we can't be after only meeting them in the previous issue. I do like them, don't get me wrong. I'm just not attached to them enough for there to be a tug on my heart when Emma gets overrun by this infection.Let's see what happens next. Even better than the first issue. I wish I'd had something like this as a kid! The girls are supportive of each other, fight monsters, have high school lives, deal with bullies, navigate romance, and more! 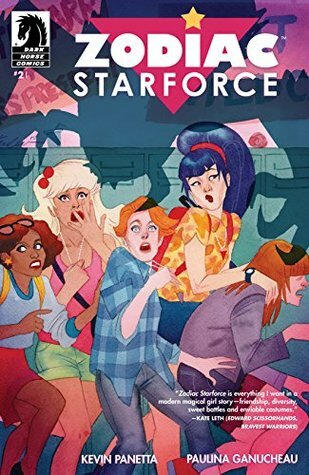 It's a very inclusive, positive book that focuses on friendship, and - even if it may sound like it's for kids/young adults - Zodiac Starforce is something everyone would be better for reading. Something about Gemini has been rubbing me the wrong way since the first issue and I think it's because she never tells the girls anything and as the leader that's a big no-no in my books. The romance with Savi and Lily is so adorable in these awkward blushes and cute smiles, cuteness overload!! Things are in chaos though so I wonder how worse it can get. This issue is only slightly better than the first. I like that Alice, that everyone was looking for, has become one of the "mean girls", since she is fun in this issue. I also like that one of the Zodiac girls started a yuri relationship with her friend. BY THE POWER OF ASTRA THIS IS MY NEW FAVORITE THINGI let out a super high pitched squeal at Lily/Savannah's scene. I NEED SAVI TO DUMP DARREN LIKE RIGHT NOW. It was kind of disappointing all the "I feel like you really understand me, although we met two weeks ago"
I've been looking for something new to read. I think this could be it. Light and bright in both colouring and artwork but seems to have a much darker story. I hope this is a good series. I really wish I had issue 3, so I could keep reading.